KUALA LUMPUR, Malaysia - Dozens of Malaysian Muslims paraded yesterday with the head of a cow, a sacred animal in Hinduism, in a dramatic protest against the proposed construction of a Hindu temple in their neighborhood. The unusual protest by some 50 people in Shah Alam, the capital of Selangor state, raises new fears of racial tensions in this multiethnic Muslim-majority country where Hindus make up about 7 percent of the 27 million population. 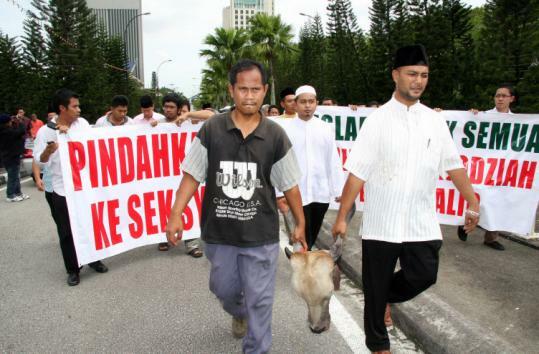 The demonstrators who marched from a nearby mosque after Friday prayers dumped the cow head outside the gates of the state government headquarters. Selangor adjoins Kuala Lumpur. Protesters stomped on the head and spat on it before leaving the site, Xavier Jeyakumar, a state government official in charge of non-Muslim affairs, said. “This is a sign of disrespect, insensitivity and a huge insult to the Indian community,’’ he said. Such an overt display of religious discord is almost unheard of in Malaysia, which has carefully nurtured racial harmony among its three main ethnic groups, Malay Muslims, Chinese, and Indians, since 1969 when the country suffered its worst racial riots.